1953 US and British intelligence services engineer a coup in which Iranian military officers depose Prime Minister Muhammad Mussadeq, a leading exponent of nationalising the oil industry. 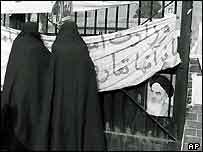 1979 16 January - US-backed Shah of Iran forced to leave the country after widespread demonstrations and strikes. 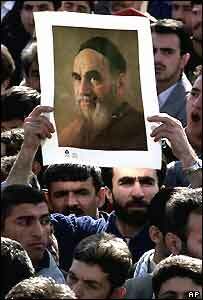 1979 1 February - Islamic religious leader Ayatollah Khomeini returns from exile and takes effective power. 1979 4 November - Iranian students seize 63 hostages at US embassy in Tehran, prompting drawn-out crisis leading to severing of diplomatic ties and sweeping US sanctions against Iran. Their initial demand is that the Shah return from the US to Iran to face trial. Later Iran also demands the US undertake not to interfere in its affairs. 1980 25 April - Secret US military mission to rescue hostages ends in disaster in sandstorm in central Iranian desert. 1980 27 July - Exiled Shah dies of cancer in Egypt, but hostage crisis continues. 1980 22 September - Iraq invades, sparking a war with Iran which lasts the rest of the decade. While several Western countries provide support to Iraq during the war, Iran remains diplomatically isolated. 1981 20 January - Last 52 US hostages freed in January after intense diplomatic activity. Their release comes a few hours after US President Jimmy Carter leaves office. They had been held for 444 days. 1985/6 US holds secret talks with Iran and makes weapons shipments, allegedly in exchange for Iranian assistance in releasing US hostages in Lebanon. With revelations that profits were illegally channelled to Nicaraguan rebels, this creates the biggest crisis of Ronald Reagan's US presidency. 1987/8 US forces engage in series of encounters with Iranian forces, including strikes on Gulf oil platforms. 19883 July - US cruiser Vincennes mistakenly shoots down Iran Air Airbus over the Gulf, killing all 290 people on board. 1989 3 June - Ayatollah Khomeini dies. President Khamenei is appointed supreme leader the following day. 1989 17 August - Hashemi Rafsanjani sworn in as president, with apparent backing of both conservatives and reformers in the leadership. 1990/91 Iran remains neutral in US-led intervention in Kuwait. Rapprochement with West hindered by Ayatollah Khomeini's 1989 religious edict ordering that British author Salman Rushdie be killed for offending Islam in one of his novels. 1992/3 Iran criticises perceived US regional interference in the wake of the Gulf War and the 1993 Israeli-Palestinian peace agreement. 1993 US President Bill Clinton takes office. 1995 President Clinton imposes oil and trade sanctions on Iran for alleged sponsorship of "terrorism", seeking to acquire nuclear arms and hostility to the Middle East process. Iran denies the charges. 1996 Mr Clinton stiffens sanctions with penalties against any firm that invests $40m or more a year in oil and gas projects in Iran and Libya. 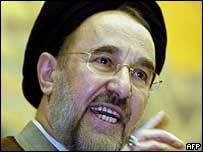 1997 23 May - Muhammad Khatami elected president of Iran. 1998 President Khatami calls for a "dialogue with the American people" in American TV interview. But in a sermon a few weeks later he is sharply critical of US "oppressive policies". 1999 Twentieth anniversary of US embassy siege. Hardliners celebrate the occasion, as reformists look to the future rather than the past. 2000 18 February - Iranian reformists win landslide victory in general election. Shortly afterwards, President Clinton extends ban on US oil contracts with Iran, accusing it of continuing to support international terrorism. 2000 March - US Secretary of State Madeleine Albright calls for a new start in US-Iranian relations and announces lifting of sanctions on Iranian exports ranging from carpets to food products. Iranian foreign ministry initially welcomes the move, but Ayatollah Khamenei later describes it as deceitful and belated. 2000 September - Mrs Albright meets Iranian Foreign Minister Kamal Kharrazi at UN in New York - the first such talks since diplomatic ties were severed in 1979. 2001 June - The US alleges that elements within the Iranian Government were directly involved in the bombing of an American military base in Saudi Arabia in 1996. Tehran angrily rejects the allegations. Bush branded Iran as part of an "axis of evil"
2001 September - Report by Central Intelligence Agency accuses Iran of having one of the world's most active programmes to acquire nuclear weapons. The CIA report says Iran is seeking missile-related technology from a number of countries including Russia and China. 2002 29 January - US President George W Bush, in his State of the Union address, describes Iran, Iraq and North Korea as an "axis of evil". He warns that the proliferation of long-range missiles being developed in these countries is as great a danger to the US as terrorism. The speech causes outrage in Iran and is condemned by reformists and conservatives alike. 2002 September - Russian technicians begin construction of Iran's first nuclear reactor at Bushehr despite strong objections from US. 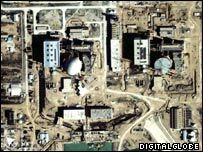 2002 December - The US accuses Iran of seeking to develop a secret nuclear weapons programme and publishes satellite images of two nuclear sites under construction at Natanz and Arak. 2003 February-May - The UN's International Atomic Energy Agency (IAEA) conducts a series of inspections in Iran. The country confirms that there are sites at Natanz and Arak under construction, but insists that these, like Bushehr, are designed solely to provide fuel for future power plants. 2003 June - White House refuses to rule out the "military option" in dealing with Iran after IAEA says Iran "failed to report certain nuclear materials and activities". But IAEA does not declare Iran in breach of Nuclear Non-Proliferation Treaty. 2003 September - Washington says Iran is not complying with non-proliferation accords but agrees to support proposal from Britain, France and Germany to give Iran until end of October fully to disclose nuclear activities and allow surprise inspections. 2003 October-November - Tehran agrees to suspend its uranium enrichment programme and allow tougher UN inspections of its nuclear facilities. An IAEA report says Iran has admitted producing plutonium but adds there is no evidence that it was trying to build an atomic bomb. However, US dismisses the report as "impossible to believe". The IAEA votes to censure Iran but stops short of imposing sanctions. 2003 December - US sends humanitarian aid to Iran after earthquake kills up to 50,000 people in city of Bam. US Deputy Secretary of State Richard Armitage and Iran's permanent envoy to UN, Mohammad Javad Zarif, hold telephone talks in a rare direct contact. 2004 January - President Bush denies that US has changed its policy towards Tehran and says moves to help Iran in the wake of earthquake do not indicate a thaw in relations. 2004 March - A UN resolution condemns Iran for keeping some of its nuclear activities secret. Iran reacts by banning inspectors from its sites for several weeks. 2004 September - The IAEA passes a resolution giving a November deadline for Iran to suspend uranium enrichment. Iran rejects the call and begins converting raw uranium into gas. A US nuclear monitor publishes satellite images of an Iranian weapons facility which it says may be involved in work on nuclear arms. 2004 November - Iran agrees to a European offer to suspend uranium enrichment in exchange for trade concessions. At the last minute, Tehran backs down from its demand to exclude some centrifuges from the freeze. The US says it maintains its right to send Iran unilaterally to the UN Security Council if Tehran fails to fulfil its commitment. 2005 January - Europe and Iran begin trade talks. The European trio, France, Germany and the UK, demand Iran stop its uranium enrichment programme permanently. 2005 February - Iranian President Mohammed Khatami says his country will never give up nuclear technology, but stresses it is for peaceful purposes. Russia backs Tehran, and signs a deal to supply fuel to Iran's Bushehr reactor. 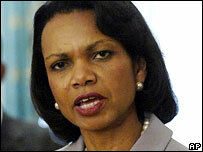 New US Secretary of State Condoleezza Rice says attacking Iran is not on the US agenda "at this point in time". 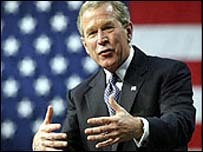 2005 March - President George W Bush signals a major change in policy towards Iran. He says the US will back the negotiation track led by the European trio - EU3 - and offer economic incentives for the Islamic state to give up its alleged nuclear ambitions. Mr Bush announces the US will lift a decade-long block on Iran's membership of the World Trade Organization, and objections to Tehran obtaining parts for commercial planes. 2005 June - Mahmoud Ahmadinejad, Tehran's ultra-conservative mayor, wins a run-off vote in presidential elections, defeating cleric and former president Hashemi Rafsanjani. 2005 July - The US concludes that President Ahmadinejad was a leader of the group behind the 1979 hostage crisis at its embassy in Tehran, but says it is unsure whether he took an active part in taking Americans prisoner. 2005 August - President George W Bush makes the first of several statements in which he refuses to rule out using force against Iran. 2005 August-September - Tehran says it has resumed uranium conversion at its Isfahan plant and insists the programme is for peaceful purposes. The IAEA finds Iran in violation of the nuclear Non-Proliferation Treaty. 2006 March - US Secretary of State Condoleezza Rice says the US faces "no greater challenge" than Iran's nuclear programme. 2006 April - A report in the New Yorker suggests the US is planning a tactical nuclear strike against underground nuclear sites - a claim Washington denies. Iran says it will retaliate against any attack and complains to the UN. Iran announces it has successfully enriched uranium - prompting Ms Rice to demand "strong steps" by the UN. An IAEA report concludes Iran has not complied with a Security Council demand that it suspend uranium enrichment. 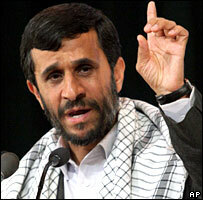 Mr Ahmadinejad insists the pursuit of peaceful nuclear technology is Iran's "absolute right". Tehran offers to hold direct talks with Washington on the situation in Iraq, in what would have been the first such talks since 1980. Tehran later withdraws the offer. 2006 May - The US, Britain and France table a draft resolution at the United Nations Security Council calling on Iran to suspend uranium enrichment or face "further action". In response, Iran's parliament threatens to pull out of the nuclear Non-Proliferation Treaty if pressure over its nuclear programme increases. Later that month, the US offers to join EU nations in direct talks with Iran if it agreed to suspend uranium enrichment and reprocessing work. 2006 December - The UN Security Council unanimously passes a resolution imposing sanctions on Iran over its nuclear programme. 2007 January - Under Secretary of State Nicholas Burns says that members of the Iranian Revolutionary Guard had been arrested in Iraq. He said they had been "engaged in sectarian warfare". In his State of the Union address on 24 January, Mr Bush lumps Iran with al-Qaeda: "It has also become clear that we face an escalating danger from Shia extremists who...take direction from the regime in Iran," he says. "The Shia and Sunni extremists are different faces of the same totalitarian threat." A few days later, seeking to ease concerns about a future military confrontation with Iran, the US president says he has "no intent" to attack the country. 2007 February - US officials say they have proof that Iran has provided sophisticated weapons which have been used to kill American soldiers in Iraq. This is rebuffed by President Ahmadinejad in an interview with an American television station. He dismisses the claims as an "excuses to prolong the stay" of US forces. 2007 March - The US ambassador to Iraq, Zalmay Khalilzad, holds a meeting with an Iranian team at a conference of Iraq's neighbours in Baghdad. The talks are the first formal encounter between the two sides for more than two years. 2007 May - The US Ambassador to Iraq, Ryan Crocker, and his Iranian counterpart Hassan Kazemi Qomi hold the first high-level talks between the two countries in almost 30 years. Iraq's security was the only item on the agenda at the event in Baghdad, hosted by the Iraqi Prime Minister Nouri Maliki. 2007 June - The US threatens to get much tougher with international energy companies that do business with Iran. 2007 July - The US Ambassador to Iraq, Ryan Crocker, and his Iranian counterpart Hassan Kazemi Qomi, hold a second round of talks during which the US says Iran has increased support for militia groups in Iraq in recent months. 2007 July - The US military accuses Iran of training militias firing rockets and mortars on Baghdad's heavily protected Green Zone. 2007 August - Officials from Iran's Revolutionary Guards (IRGC) denounce reported US plans to designate the force as a foreign terrorist unit as "worthless". 2007 August - President Bush warns Iran to stop supporting the militants fighting against the US in Iraq. 2007 September - Iran has met a key target for its nuclear programme and now has 3,000 centrifuges enriching uranium, President Ahmadinejad announces. 2007 September - Iran's Supreme Leader Ayatollah Ali Khamenei says he is sure President Bush will be tried in an international court for what had happened in Iraq. 2007 September - The New York authorities reject a request from President Ahmadinejad to visit the site of the 11 September 2001 attacks. 2007 September - President Ahmadinejad says Iran is not heading for armed conflict with the United States. 2007 September - US Secretary of State Condoleezza Rice attacks the head of the UN nuclear watchdog for urging caution in the dispute over Iran's nuclear programme. The criticism came after IAEA chief Mohamed ElBaradei said force should be a last resort in the Iran dispute. He dismissed talk of military action in Iran as "hype" and urged people not to forget the lessons of war in Iraq. 2007 September - Iran releases on bail the last of three Iranian-Americans whom it had detained on security grounds. 2007 October - Washington's military commitments to Iraq and Afghanistan would hamstring an attempt to wage war on Iran, the Iranian foreign minister says. 2007 October - Top US military commander in Iraq, Gen David Petraeus, accuses Iran's ambassador of belonging to an elite unit of Iran's Revolutionary Guards. Gen Petraeus said Hassan Kazemi-Qomi was a member of the Quds Force, which the US believes backs foreign Islamic militant movements. 2007 October - The US steps up its sanctions on Iran for "supporting terrorists" and pursuing nuclear activities. The new measures target the finances of Iran's Islamic Revolution Guards Corps and three state-owned banks. 2007 November - The US military in Iraq releases nine of the 20 Iranian citizens it had detained there, including two held on suspicion of helping Shia militants. 2007 November - In a new report, the UN nuclear watchdog says Iran has supplied transparent data on its past nuclear activities but adds it has limited knowledge of its current work. The US vowed to push for further UN sanctions against Iran, following the IAEA report. But Iran's President Ahmadinejad says the report showed Iran had been truthful about its nuclear activities - and the US and its allies should apologise for their treatment of Iran. 2007 November - Iran says it has agreed to a US proposal for a new round of talks on improving security in Iraq. 2007 December - A US intelligence assessment said that Iran had halted a nuclear weapons programme in 2003. The National Intelligence Estimate assessment said Tehran was, however, continuing to enrich uranium. Iranian President Mahmoud Ahmadinejad called the US report a "great victory" for Iran. But President Bush said that Iran should reveal the full extent of its nuclear programme, or risk further international isolation. 2007 December - US Defence Secretary Robert Gates said Iran still posed a serious threat to the Middle East and the US. Mr Gates told a Bahrain conference Iran may have restarted its nuclear weapons programme, despite a US intelligence report saying it had stopped. 2007 December - Iran sends a formal protest letter to the United States, accusing it of spying on Iran's nuclear activities. 2007 December - Washington says Iran has no need to continue its own nuclear programme after Russia started delivering fuel to the Bushehr power plant. 2008 January - Iran's Supreme Leader, Ayatollah Ali Khamenei, said relations with the US could be restored in the future. 2008 January - The US says five Iranian speedboats harassed three US navy ships in the Strait of Hormuz, approaching them and radioing a threat to blow them up. Iran denied this and broadcast its own video of the stand-off which shows no sign of any threat. A senior US official later said the radio threat may have been a misread signal originating from elsewhere. 2008 January - Describing Iran as "the world's leading state sponsor of terrorism", President Bush says he is rallying friends to confront it "before it's too late". 2008 July - Reports say the US is planning to establish a diplomatic presence in Tehran by opening an interests section in the capital, which would be its first diplomatic presence in the country for 30 years. 2008 November - President Mahmoud Ahmadinejad offers congratulations to Barack Obama after his election as US president. During the election campaign, Mr Obama had offered talks with Iran without preconditions.